A fuel protest (go-slow) has been re-schedulaed for Coryton Oil Refinery in Essex this Saturday January 29 due to what the organisers claim was “Police harassment”. The refinery is the busiest in the United Kingdom providing oil to BP, Shell and Exxon to name a few. By blockading the road, the protesters believe that fuel distribution be stopped dead. Every tanker that is stopped from exiting prevents 34,000 litres (7,500 gallons) of fuel flowing into London. This is not not the first time protesters have targeted the refinery. In October 2010 protesters claimed to have stopped 375,000 gallons of fuel from leaving the site. For more information on the protest please see the protesters Facebook page, long live Social Networking! 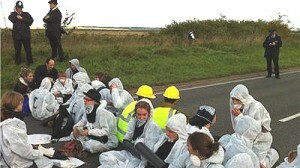 If you have any further information on this or any other fuel protest 2011 then please contact us. Instead of all bitching about the ridiculous price of fuel, why don’t we all make a stand TOGETHER? we are all suffering the ever increasing price of fuel. wether we drive or not, as the price of food and delivery costs is all being affected. Please remember this is a peacefull demonstration, and we are purely there to show everyonel that we have had enough, and despite everyone else WE are the ones who are prepared to make a stand. Please remember to bring flasks (banners if you wish) and wrap up warm. NOW is the time to act, we’ve all spoke about it, now lets see who is prepared to actually do something about it!